Hohepa is a community for children and adults who have intellectual disabilities or autism. Through living, working and taking an active part in community life, the people we support grow to experience satisfying lives with as much independence as possible. The principles of Rudolf Steiner’s work provides inspiration within Hohepa Canterbury. It is this inspiration that creates our distinctive approach to working with people with disability. 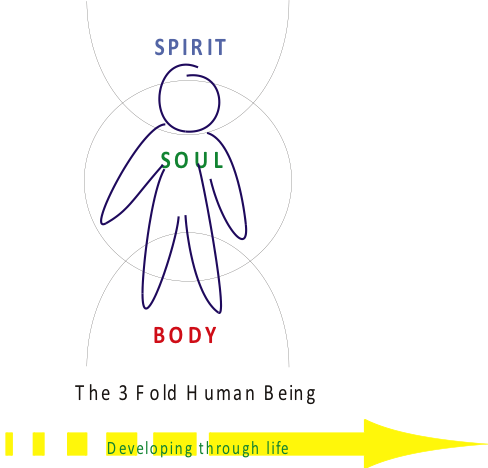 The foundation of our work begins by understanding each person comprising of Body, Soul and Spirit. In the diagram on the right, we can see how these three aspects work together. In working with disabled people, we are interested in considering well-being with each of these aspects. This means that the focus at Hohepa goes beyond the physical care or skill development. It is also about how the soul and spirit can be respected and strengthened that every person can be more soundly on the earth. The environment I find myself in. To be ‘well’ the body itself needs feeding, exercise, care, hygiene and maintenance. When it has these things the person develops a sense of belonging and a sense of trust. true (quality materials and design so that it supports what happens there eg. it is spacious or natural). A healthy environment is also a place that changes and develops e.g. it reflects the seasons; it is changed and refreshed to meet changing needs. Creating physical environments for work and living that are good to experience. A healthy soul is one that has rich and full experiences (where we connect to the world and people around us). For this to happen we need skills – social skills, communication skills, work skills. The gateway to the soul and to developing our relationship ability in is through our senses. It is our senses that enable us to take in the world, and to create our own inner experience and response. So not only do we need to build skill, but we can enhance our development by caring for the social environment, working consciously with things such as social space, how we connect and disconnect; it is all about taking care in planning how we meet, live and work. Like the physical body the soul too needs nourishment. At this level it is a nourishment of the senses. This happens through human contact and communication, through art, colour, and music. Such things give us the possibility of a truly human experience – across a spectrum that ranges from happiness to sorrow, or from excitement or dread, or from pleasure to pain. All are important. Developing skills and capacities and an environment that enables us to build and maintain relationships. 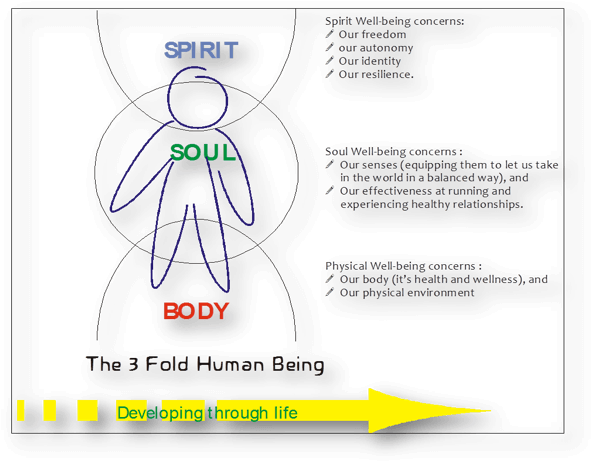 In the diagram we can see that it is our spirit that reaches up beyond the earth, seeking existence that is beyond the physical world. Our spirit is our sense of self – our freedom, autonomy, identity, and resilience. It is where our hopes, wishes, aims and goals live – our inner hopes of what we might be and might become; and of what the world might become. It is also where we grasp time – the concept of yesterday, today and tomorrow. Accepting myself and others as unique individualities. We can build this spirit wellbeing through careful thinking – thinking that lets us make sense and meaning of where we find ourselves in the world and the possibilities that are in front of us. Being quiet and reflective, that the world might speak to us.